1. Which port is marked in the below diagram? 3. 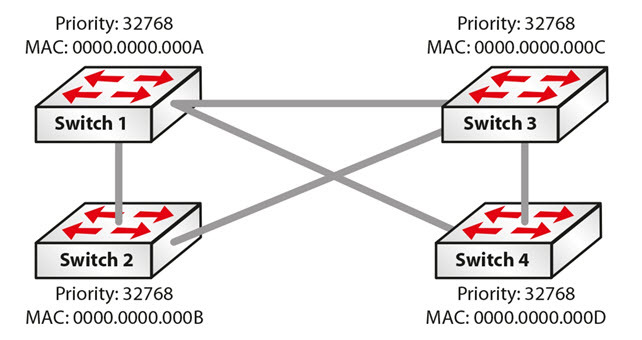 In the spanning tree learning state the switch discards frames received from the attached segment. 4. BPDU Guard should be enabled on all ports with Port Fast enabled. 5. BPDUs are sent every ___ seconds. 6. The STP Bridge Priority values range from 0 to _____. 7. Which bridge is elected root? 8. STP port states include (choose all that apply). 9. The default port cost for Fast Ethernet is? 11. Per VLAN Spanning Tree Plus (PVST+) allows for an individual STP instance per VLAN. 12. In the spanning tree listening state the switch discards frames received on the port from the attached segment. 13. The BPDU Guard feature prevents the port from receiving any BPDUs but does not prevent it from sending them. If any BPDUs are received, the port will be errdisabled. 14. 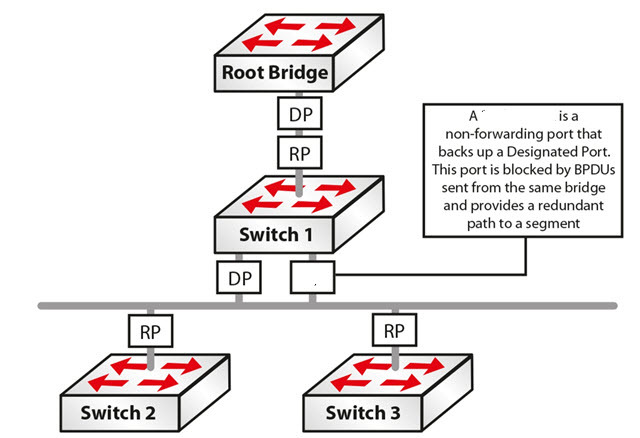 Port Fast is a feature that is typically enabled only for a port or interface that connects to a switch. 15. The Root Guard feature prevents a Root Port from becoming a Designated Port. 16. The Port Fast feature does effectively disables Spanning Tree on the selected port. 17. What type of port is obscured in the below fig? 18. All your switches are left at default settings. Which of the below commands will set your switch to be the STP root? 19. When configured at interface level BPDU Filter effectively disables STP on the selected ports by preventing them from sending or receiving any BPDUs. 20. STP port Listening state can be mapped to RSTP ____ state. 21. RSTP is backwards compatible with STP. 22. RSTP uses the same BPDU as STP. 23. STP is defined in ____? 25. The STP Max Age timer is? 26. The Uplink Fast feature provides faster failover to a redundant link when the indirect link fails. 27. In the spanning tree forwarding state the switch _____ frames received from the attached segment. 28. RSTP performs similar functions to Uplink Fast and Backbone Fast. 29. All your switches are left at default settings. Which of the below commands will set your switch to be the STP root?